Will the Malaysian Economy Risk another Financial Crisis in 2015? If any of you can remember for the past few months our government has been engaging on a propaganda spree claiming that our economy is doing excellent and our budget deficit is on track hitting the 3% target. In addition it is also reported that our household sector is supported by sustained income growth and hence consumption. Our high level of international reserves, current account surplus, resilient domestic financial system and low level of external debt helps reinforce the strength of our economy. Bank Negara even forecast a GDP growth between 5.0 to 5.5% for fiscal 2015? Is our economy really that resilient and solid? This article aims to dissect the reported facts above and also at the same time gauge the performance of the Malaysian economy. From 1990 to 2013, Malaysia’s external debt averages about RM 43 billion but somehow as of the 2nd quarter of 2014 it exploded to RM 740 billion (Chart shown below). This represents an astonishing further 17x leverage in the past year. I do not know have the breakdown on where are those funds headed to but I suspect some might have gone to 1MDB or One Malaysia Development Berhad, another Malaysia Sovereign Wealth Fund. Getting highly geared during such challenging economic times is not only unwise but suicidal especially when you are on the wrong side of the fence. This is because our Ringgit has been depreciating sharply recently. I shall go into details next on why we are in trouble when leveraged with foreign money no matter what currency it is denominated in. Due to the near zero interest rate policy in the West and the excess supply of funds available, naturally money will always go to the place where it is best treated. Hence as a result there was a frantic search for a higher yield debt market. There is no better place than Asia because Asia offers one of the safer and higher yield market. Consequently, there was a huge inflow of funds especially from Europe to Asia since 2009. This can be shown by the following chart. 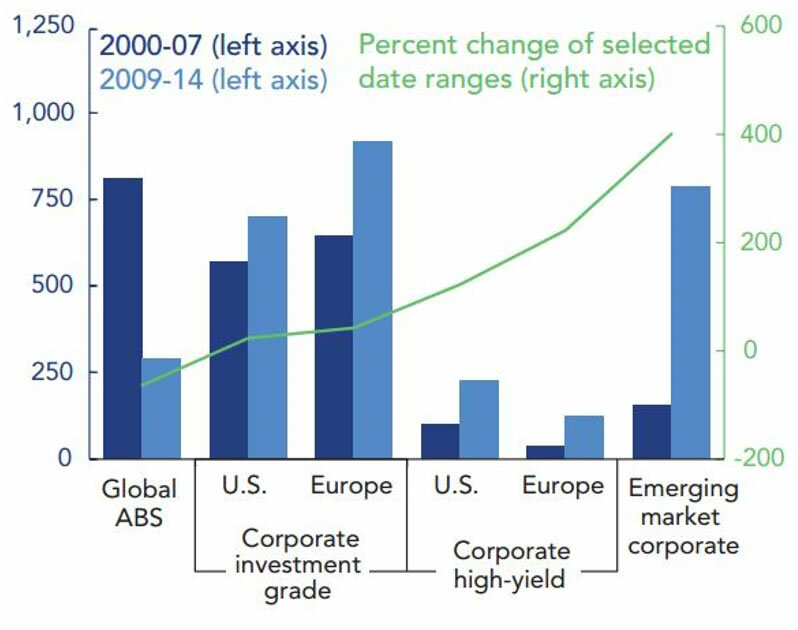 As seen, the emerging market corporate debt market has grown more than 400% since 2008 and is still growing. One reason for the massive increase is the growth of the corporate bond market. Instead of relying on the traditional bank financing, more corporations are looking into non-bank financing options which also offers a cheaper solution. As a result the corporate bond market in Asia has grown tremendously in recent years. This can be demonstrated by the following graph. Total outstanding debts in bond are worth about USD 2.6 trillion. This is huge and a time bomb waiting to explode. So how big is Malaysia’s Bond market? The following chart best depicts the size of our bond market. Malaysia’s bond market is one of the biggest in Asia (about 50% to GDP) due to the fact that Malaysia can be said to be the center for issuing and trading Islamic bonds. So what are the risks of having a large portion of debts denominated in bonds? Firstly since bond is a form of debt and any debts that are leverage to the hilt always poses a danger. If the bonds are denominated in USD then there is always the danger of exposing to the risk of ‘Foreign Exchange Exposure’. Foreign exchange exposure refers to a situation where you are exposed to the ups and down (volatility) of the foreign currency the loan is denominated. For example, if a corporate had raised USD 10 million from the bond market in 2012 with the prevailing exchange rate of 3.10. Putting aside the interest rate, total debt payable converted to Malaysian Ringgit shall be RM 31 million. What happens when our Ringgit depreciates against the Dollar like what is happening now? With the current exchange rate of 3.46, the principal amount payable will increase to RM 34.6 million. Hence, there is a foreign exchange loss of RM 3.6 million. However, this risk can be reduced through hedging using tools like Currency Options, Currency Futures or Currency Forward Contracts. However I doubt it if there are many corporate borrowers hedged their foreign currency exposures due to the high costs associated with it. What happen when the bonds are denominated in local currency or Ringgit? Well foreign bond holders will be on the losing side. This is because when they exit the bond market they will be getting less USD when they convert their Ringgit to the USD. To ensure the bondholders do not exit at the same time, interest rates will have to increase as a form of compensation. This is because the price of bonds relates inversely with the yield. When they start selling, the price of bonds will go down but the yield will go up. The risk is when every bondholders start rushing for the exit, this will cause a meltdown in the bond market. As we have known our Ringgit has been on the downtrend since last year only recuperating some losses beginning of this year. However the slide begins again and it looks like we are yet to see the worse. The following chart denotes the exchange rate between the USD and our Ringgit. As can be seen it is now fast approaching the 3.70 level that was set back in 2009 during the Global Financial Crisis. Similar to the Bank of Indonesia’s intervention into the Rupiah on 17/12/2014 to prevent it from sliding below the 2008 level, Bank Negara Malaysia has also been involve in the intervention of the Malaysian Ringgit through open market operation by selling the Dollar to prevent further slide of the Ringgit. This can be shown by the sharp decline of our Foreign Exchange Reserves in the following chart. From the chart above, our Foreign Exchange Reserves peaked at $155 billion in August 2011 but has since been declining rapidly. In October our Foreign Reserves stood at $134 billion, a drop of $21 billion from the peak. We have been recording Balance of Payment surplus for the past many years and by right the excess Dollars should be added into the Foreign Exchange Reserves. Yet we are seeing dwindling reserves and one explanation will be some of the reserves are being used for open market operations to support the Ringgit. Similar to a fall in oil price, a fall in the Ringgit will have both negative and positive effects. Positive effects includes more exports hence more foreign currency receipts and negative effects include higher import costs and hence higher inflation. As already mentioned above, one of the major side effects of the appreciation of the Dollar will be exiting by foreign bondholders and hence the repatriation of the Dollar. The Federal Reserve has already started tapering and eventually this will lead to a Dollar liquidity crunch. To overcome this imbalance, funds will have to be redirected from elsewhere. The Dollar Liquidity Crunch caused by tapering will ultimately lead to an interest rate hike soon. When interest rates are hike, it will attract more Dollars from abroad and this will further strengthen the Dollar. In a way this will cause a feedback loop whereby the faster the U.S economy recovers then the higher the U.S Dollar appreciates. This spells trouble for countries sitting on the wrong side of the fence (having huge foreign debts). The following Dollar index chart shows how fast the Dollar appreciates in the last few months. Notice that the Dollar started to appreciate in July when it moved above the Moving Average 50 and 200 days. Not only that if you take a look at the Brent Crude Oil chart below, the price of crude oil also started to drop n July. What this tells us is that there exist a correlation between the price of oil and the Dollar. As I have indicated above, the Dollar is expected to keep strengthening due to the Dollar liquidity crunch and interest rate hike. This means that the price of oil will have problem moving higher as long as the value of the Dollar remains high. But the peculiar thing is that even when our Ringgit is falling, our exports volume declined as compared to import volume recently. Why is this happening? I will try to address the problem below on why our exports are declining. Balance of Trade or trade balance is the difference between a country’s exports and imports. A country is experiencing a deficit when imports exceed exports. Likewise a surplus will be the reverse. Malaysia recorded a trade surplus of only RM 1.186 billion in the month of October 2014. This represents a sharp decline as compared to a surplus of RM8.23 billion in October 2013. This has due to the increased in import by 9.1% and a fall in exports by 3.1% (RM 67.19 billion in Oct 2013 and RM 65.1 billion in Oct 2014) during that period of time. From below our current trade balance has recorded one of the worst readings for the past 10 years. Again from the Currency chart above, even when our ringgit was trading at the lowest (USD/MYR = 3.70) in 2009, we recorded one of the highest positive trade balance of RM 16 billion. So what caused our exports to decline? There are two reasons attributed to this conundrum. One might be that our Ringgit has not been depreciated as drastically as other currencies. For example the Indonesian Rupiah depreciated to a low of 12,725 to the Dollar on 14/12/2014 which was lower than the level set back in 2008. Thus, this made Indonesian exports like Rubber, Palm oil and other commodities cheaper than Malaysia, hence contributed to our decline in exports. The other more important factor is our declining level of competitiveness. Although our authorities claimed that our country is getting more competitive in the international arena but statistically it proved otherwise. A good statistical tool to demonstrate the competitiveness of a country will be the Current Account (CA) to GDP. If a country exhibits a strong CA/GDP then it is consider very competitive because of its strong exports. Likewise if a country is experiencing a low CA/GDP reading then its competitiveness is deteriorating due to declining exports. As shown above Malaysia’s CA/GDP has been on the decline since 2008 and recently recorded the lowest for the past 10 years. In 2013, our economy recorded a 4.7% reading in the ratio. So what are we going to do to reverse the trend? I reckon it is best to leave it to our experts in the government. Malaysia has been experiencing a steady decline in its crude oil production. Production peaked in October 2004 with 790,000 barrels per day. This can be shown by the chart below. The price of crude oil has been holding above the $100 for about 43 months before it began to slide downwards in July this year. The recent fast and huge decline in oil price is also known as the Mega Oil Price Crash. This extent of the carnage can be shown by the chart below. What are ramifications to our economy when oil price crashed? Less oil revenue received. Based from the above data, we can calculate the approximate loss of revenue from our oil exports. With the following assumption. Daily Oil Output = 550,000 barrels a day. Averaged from Jan – Dec 2014. Revenue as per July 2014. Per year loss of revenue = $26.75 x 365 = $9.763 billion x 3,476 = RM 33.94 billion. Even with the recent complete removal of fuel subsidies which amounts to about 2.3% of GDP, it still not enough to cover the loss in revenue. Malaysia cannot expect to use its oil revenue to balance its budget due to its high budget deficit and also being a relatively small oil exporter. According to the chart below, we needed more than $200 in oil price to balance our budget. According to IEA the price of oil should be trading between $60 to $70 from 2015 to 2016 due to demand weakness plus additional fresh supply of 2.5 million barrels per day coming from the Gorgon field in Australia, Kashagan field in Kazakhstan and also the Angolan and Columbian fields in 2016. Apart from the shale boom in the U.S, other factors affecting the demand for oil is not only the advancement battery technologies but also increased financial commitment by Governments to develop EV technologies. Germany and China has both $Billions to jumpstart their research and development transition into EVs or Electric Vehicles. Dramatic development in battery technology resulted in higher efficiency, has been made possible by companies like SeeO and Sakhti. Another recent breakthrough in battery technology using titanium was developed by the Nanyang Technology University of Singapore. The battery is made from titanium dioxide and can last up to 20 years. This enables ultra-fast charging for batteries, recharging up to 70% in 2 minutes. Electric vehicles can now be charged within minutes and can go faster and further due to the lesser weight of the batteries. So with all these developments, it will be a challenge for oil price to remain above $70 in the future. Further to this, there is no rush for OPEC to cut production and risked losing customers because they can now afford lower price to balance their budget. To show you how they can now afford lower prices to balance their public budget, I shall use Nigeria as an example. As from the above Nigeria needed about $100 to balance its public budget will now only need about $88. This is because the USD has appreciated more than 12% since July 2014. Thus, if the USD continues to rise then oil exporting countries can live with lower oil price because any revenue loss from lower price will be compensated by the gain in the USD. Malaysian Prime Minister Najib Razak said that we are on track to shrink our budget deficit down to 3% from the current 3.9%. See below. Can he do it? Looking at the global economic scenario developing at the moment I reckon it is very difficult if not impossible to achieve the target. Firstly Malaysia is an oil exporter nation and hence its oil revenue will be subjected to the volatility of the global oil price. When oil price was above $100 it is very likely we can achieve the deficit target given the recent complete fuel subsidy removal and the intended implementation of GST April next year. Given the recent mega oil price crash that has taken everyone by surprise, the equation on balancing budget has certainly changed. Below is the table that shows the impact of a $10 reduction in oil price on GDP growth. As can be seen from above, a $10 reduction in oil price will slice of 0.2% from Malaysia’s GDP growth. If the current oil price stays at around $60 - $70, then our next GDP growth next year will be reduced by at least 0.6%. GDP or the National Income (Y) can be defined as follows. After netting off the Consumption or C, the equation can be re-written as follows. The following shows our savings rate which have been on the decline since 2002. Thus by assembling all the data above we can derive the performance of the different economic indicators and the results can be summarized as follows. So how can we reduce our budget deficit when our economic indicators moved in different directions? One way to do it is to massively increase the taxation income and drastically cut back on government spending. Unfortunately both are not the best option at the moment. If both are not practical then we will have to resort to borrowing from external sources. Hence, this helps explain why our External Debt has grown from RM43 billion to RM740 billion. In wrapping, from above and going through the complete cycle you notice that not all is about oil, it has much more to do with the USD. The current turmoil in the oil market has benefited the USD by regaining some relevance as the reserve and trading currency. According to the IEA, currently there exists an excess supply of about 2 million barrels a day that caused the current dampening oil prices. The funny thing is that if there exist an oversupply for years, why has the oil price managed to stay above the $100 level for more than 43 months. Another argument is that oil price can resume back above $100 in no time if the American Government decides to soak up the extra supply into its strategic reserve. By adding the extra 2 million barrels a day to its strategic stockpile, it only cost the American Government about $77 million a day ($100-$61.38 x 2 million barrels). That works out to be about $2.31 billion in a month. What is $2.3 billion when compared to the monthly injection of $85 billion into the economy by way of Quantitative Easing? Hence, the BIG picture is all about the USD. It is the main threat to the emerging markets as their exposure to external debts amounts to $5.7 trillion. Out of that $3.1 trillion are in bank loans and $2.6 trillion in bonds. If the U.S continues to pursue Exchange Rate Stability then the rise in the USD will certainly increase the risk of credit default in emerging markets. The question is how long can the emerging markets sustain their pain threshold? If there is another black swan event causing Western lenders to recall their loans and exiting the door at the same time, then emerging markets currency will faced meltdown and hence causing another Financial Crisis. The author is the Economic Advisor to the National Union of Bank Employees.